Monday January 12th 1920 Vere busy with the washing. I crotcheted some. Late in afternoon wrote to The Ashleys and The Reed Girls. It is 13 months today since we buried Will. 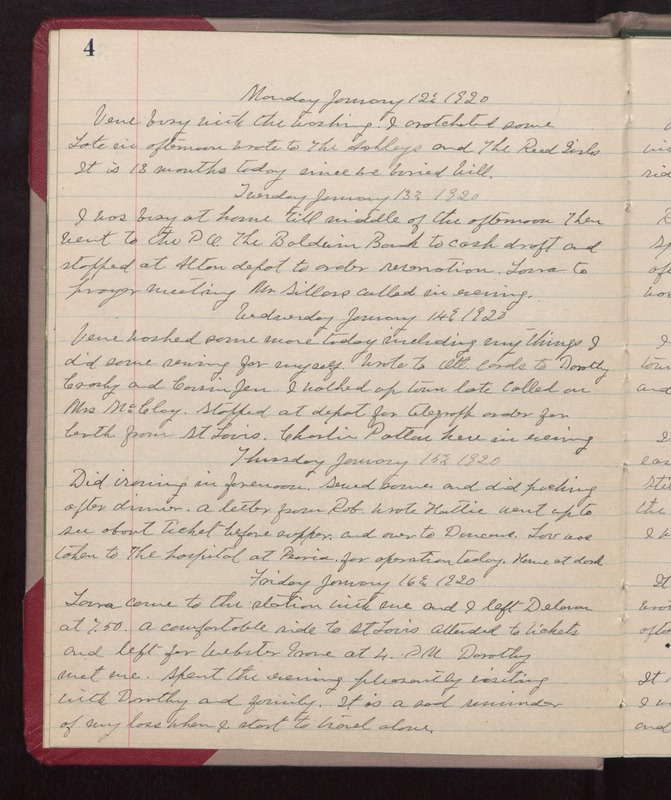 Thursday January 13th 1920 I was busy at home till middle of the afternoon. Then went to the PO. The Baldwin Bank to cash draft and stopped at Alton depot to order reservation. Laura to prayer meeting Mr Sillars called in evening. Wednesday January 14th 1920 Vere washed some more today including my things. I did some sewing for myself. Wrote to Ott. Cards to Dorothy Crosby and Cousin Jen. I walked up town late. Called on Mrs McClay. Stopped at depot for telegraph order for berth from St Louis. Charlie Patton here in evening Thursday January 15th 1920 Did ironing in forenoon. Sewed some and did packing after dinner. A letter from Rob. Wrote Hattie. Went up to see about ticket before supper and over to Duncans. Lou was taken to The hospital at Peoria for operation today. Home at dark Friday January 16th 1920 Laura came to the station with me and I left Delavan at 7.50. A comfortable ride to St Louis. Attended to tickets and left for Webster Grove at 4. PM. Dorothy met me. Spent the evening pleasantly visiting with Dorothy and family. It is a sad reminder of my loss when I start to travel alone.